Though it may be the world’s most expensive spice, one way to maximize your benefit from saffron is to use saffron extract, which has so many helpful uses that this cost is often well and happily born. For a long time, the extract was only available in Europe, but is now widely available all around the world. Whilst saffron spice adds a unique flavour and warm hue to cooking, it also has medicinal uses that range from easing lung ailments to fighting depression and Alzheimer’s disease. Throughout history, this extract has been used to treat coughs and asthma, as well as to alleviate sleeping disorders, stomach distress and sexual dysfunction or infertility. Today, modern research is helping prove the science behind these ancient remedies. There has been a lot of work in recent years on the benefits of saffron extract for people suffering from depression. A study in 2005 found that it was highly effective in helping people with a mild or moderate depression when taken every day for six weeks. Read more about the general benefits. Note: Pregnant women and nursing mothers should not use it. One exciting new way the extract is showing promise is in the fight against obesity. New studies are showing that people who use it report a reduction in hunger pangs, and a lowering of their caloric intake. The way it works is by increasing your body’s serotonin levels, which help improve your mood and regulate your appetite. People who have used some say it helps ease the sense of being hungry, and helps them avoid binge snacking. It also helps curb cravings for high fat and high sugar foods. They also report that it helps them feel fuller after a meal, so they have an easier time not overeating. It's most often taken in capsule form, usually in doses of less than 100 mg per capsule. There are no known negative side effects, however high doses of more than 500 mg a day should be avoided. The best idea is to start low, perhaps one 100 mg capsule before breakfast and then increase to two capsules before meals if you feel you need more. 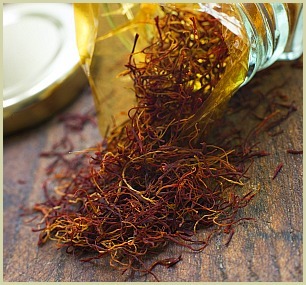 While saffron may be the world’s most expensive spice, the extract requires much less intensive labour to produce and is completely affordable. Read more general info about saffron.